Pittsburg High School, Contra Costa County California. Football programs for years 1987 to 1992. 12 items including a 1988 graduation tassel. There are 12 items in this listing, all purchased at an estate sale. They all relate to the San Francisco East Bay area in or around Pittsburg in Contra Costa County. 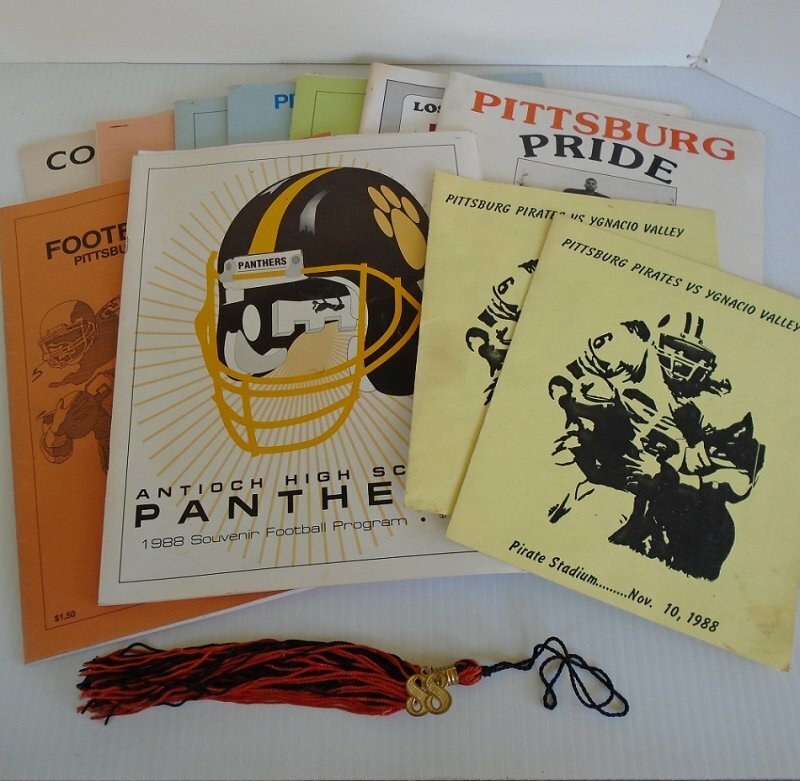 There are 10 football programs, one registration book, and one 1988 Pittsburg graduation tassel. Most all football programs relate to Pittsburg High School. All items date between the years of 1987 to 1992. There is also a 1987 Pittsburg registration book. It flipping through it, it appears this describes the requirements for graduation as far as what classes must be taken and passed. It's quite interesting to see some of the classes that were mandatory and I'm not sure some of those classes are still around today. Other than what's listed above about a few pictures being cut out, the programs are all in great condition. Inside you'll find photos of the players, cheerleaders, some of the crowds, advertisements from local businesses, and other local entries. Delivery will be via USPS Priority Flat Rate envelope. Buyer to pay $7.95 delivery costs.